Stage 13 was fireworks, Stage 14 was for those who wanted to break away. It looks like the Jensie (Jens Voigt) took offence to me leaving him off the Grey Jersey points competition. The Jensie lead out the initial breakaway of four riders, but they were soon joined by quite a few other riders making the lead out group total 18 riders. Their destination was the beautiful city of Lyon and on the eve of Bastille Day (the French National Holiday) it was awesome to see the French public line the streets for the last 30km. This gave impetus to one French rider – Julien Simon to go out and attack for the win. 30km out from the finish he went out to hammer home Sojasun’s first Tour stage win. Big ups! He absolutely put his head down to go for the win. The crowd was going crazy cheering him on trying to push him to the win. There were many chases from the breakaway group to pull him back and take the win. First was Michael Albisini (the only European rider with Orica GreenWedge), but he couldn’t make it stick. Then David Millar (also from Garmin-Sharp), but he couldn’t make it stick. There was quality in this breakaway group of riders. Big callout has to go to two of the other riders in this breakaway group; Cyril “Jean-Paul” Gautier (Showboating Europcar) and Jans Bakelants (Radioshack Leopard-Tank) who demonstrated earlier in the Tour the propensity to attack. These two along with Marcus Burghardt (BMC) and Albisini finally decided to make a real effort to chase down Simon. What they didn’t count on was the high strength cement that Simon had put in his bidons. But as Simon tossed his last cement filled bidon away he was caught unluckily with only 1 km to go. A few other riders caught up too as there was nervousness in the final sprint. But it was one of the Manx Missile’s (Mark Cavendish) teammates, Matteo Trentin, who rode hard in the breakaway but didn’t do much work up front who came from well back to pip them all for the win. It was great to see the breakaway stick it and get away for the win. But I am sure it will be different tomorrow. The peloton had given up on the chase knowing that jerseys would not change hands, but I fear for the Empire (Team Sky – boo-hiss) that this may have been another miscalculation on their part. Andrew Talansky from the Rebellion (Garmin-Sharp) was able to make up some 6 minutes on the GC leader, thus catapulting him alongside his teammate Dan Martin in striking distance of the GC. For the Froome-dog in the Maillot Jaune he has many chasers in groups of two who could really start blasting away at him; Mollema and Ten Dams (from the Team formerly known as Rabobank formerly known as Blanco now known as Belkin), El Pistolero and Kreuziger (from Saxo Tinkoff), and Martin and Talansky (from the Rebellion). More fireworks to come in the 100th edition of the race. Watching the toughest sportsmen in the world, I have decided to start a “cement” ranking that reflects truly great feats of endurance and the overcoming of pain (basically a bit of HTFU). Maybe ASO could make a special jersey, grey, for this category. After grueling stage yesterday, many riders went out to smash it in the breakaway group of 18. 1. 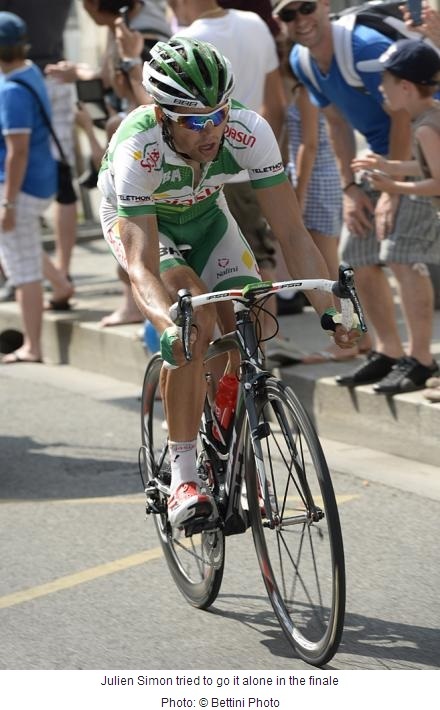 Julien Simon – Should have won the stage. 2. Jens Voigt – the instigator of the breakaway. 3. Johnny Hoogerland – who should have won a Grey Jersey last year, tried to close the gap to the group of 18 but all by himself couldn’t do it. 4. Michael Albisini – Nearly pulled it off with many attacking moves shown, but was pipped. 5. Matteo Trentin – worked phenomenally hard in the stage the day before, and went out for the win today. Great recap and thanks for the shout out! Le Géant is a beast! No probs, I can’t wait for parts two and three of your climbing assault.